Click photo to enlarge. A rare glass slide from 1885 showing the canal as it snaked through Hebden Bridge. The large building on the left is Melbourne Mill - a dominating feature of the town for over 100 years and mysteriously reduced to rubble in 1983. The Co-operative supermarket now occupies the site. ALGC. 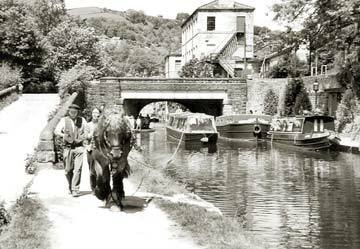 Canals, in various forms, had been in existence for hundreds of years before construction of the Rochdale Canal started in 1794. On completion ten years later the 32-mile stretch of water-way boasted no less than 82 locks, from Sowerby Bridge to Summit rising 316 feet and falling away 514 feet to Manchester. Apart from being one of Britain's finest feats of engineering it was, by common consensus, the most difficult on which to work. 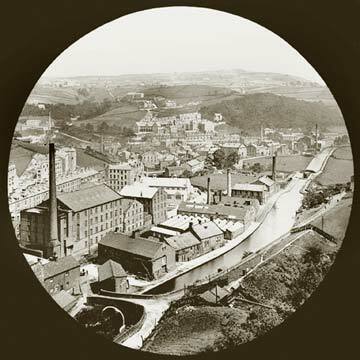 The lower section from Sowerby Bridge to Gauxholme Arches was constructed first: 500 men were taken on, each earning around 30 shillings a week - a good wage for those days. The section from Gauxholme to Rochdale came next, then finally Rochdale to Manchester, with a triumphant opening in December 1804. Picks and shovels, horses and carts, were the only means available to build the mighty water-way, involving immensely hard work not eased by the numerous problems encountered in the unrelenting terrain. So jubilation must have been mixed with a sense of relief that the project was finished - and profits could start to roll in. The arrival of the railways in the 1840s had already dealt the canals a blow but it was the growth of road transport which sounded the death knell. The final curtain came down in 1952 when an Act of Parliament was passed authorising closure, except for one-and-a-half miles at the Manchester end. But a dogged band of supporters refused to give up arguing that the canal once more should form a focal part of the South Pennines infrastructure. In 2002 the huge restoration project was finally completed and it was possible, once again, to travel the entire length of Rochdale Canal by boat.